Spotting new fish species that you’ve never seen before and can’t put a name to is one of the many exciting and fulfilling aspects of being a fish surveyor with The Living Oceans Foundation’s Global Reef Expedition. 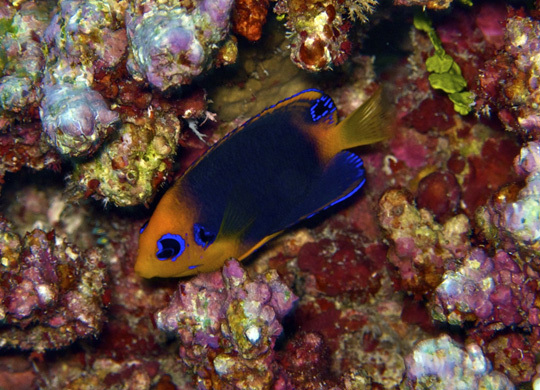 This latest expedition to the Gambier Archipelago in French Polynesia offered something particularly special – a sighting of a species of Pygmy Angelfish that according to best and current scientific knowledge has never been seen before in this island group. Introducing the Orangehead Pygmy Angelfish, Centropyge hotumatua. This colorful little critter was previously known to only occur in the far southern reaches of French Polynesia – the Austral Islands and Rapa Island (where GRE heads next! ), as well as Pitcairn Island and Easter Island. This is a rather narrow distribution for a fish species to have, so while spotting this fish in the Gambiers might not sound that exciting at first, when you consider that from the Gambiers its next known locations are ~700km to the southwest (Pitcairn’s) and ~1,000km to the east (Australs) over open ocean, it’s a pretty special find. Angelfish generally lead a rather elusive and secretive life, and Pygmy Angels are usually under 10cm in length, so it’s not entirely surprising that the Orangehead Pygmy Angelfish has gone unnoticed in the Gambiers for so long. Further, the remoteness and relative anonymity of this island group as a superb diving location has no doubt helped keep this small fish hidden in the Gambier Islands until now.